Discordant ST changes include ST elevation or depression that is in the opposite direction to the QRS complex. This includes ST elevation with a negative QRS complex, or ST depression with a positive QRS complex. Once upon a time, a new Left Bundle Branch Block (LBBB) was considered to be a STEMI-equivalent requiring emergency reperfusion. Later on it was found that there were far too many false positives if everyone with a new (or presumed new) LBBB was sent to the cath lab, so this rule was removed from the ACC/AHA guidelines in 2013.ref This means that now we need to look closer at the ECGs of patients with LBBB to find other signs to diagnose those who do have an acute infarction. Wide complex rhythms such as LBBB can be difficult to interpret because they can cause abnormal ST segments even without any acute ischemia on top.ref These changes are often called secondary ST changes because the real primary problem is the abnormal QRS. But what if a patient has both a LBBB and acute ischemia? Previously it was thought to be impossible to interpret the ST segments in the presence of a LBBB. This is no longer true, as we now have validated criteria to help us interpret these ST segments as normal or abnormal. The key concept involved is being able to tell the difference between concordant and discordant ST segments. Concordant ST changes occur in the same direction as the QRS. So, if the QRS is positive, ST elevation is a concordant change. If the QRS is negative, ST depression is a concordant change. Discordant ST changes occur in the opposite direction to the QRS. If the QRS is positive, ST depression is a discordant change. If the QRS is negative, ST elevation is a discordant change. In 1996, Sgarbossa et al. published a set of criteria to help diagnose acute myocardial infarction in the presence of a Left Bundle Branch Block. Each criteria had independent predictive value for infarction, but together they were also developed as a scoring system where a total score of 3 or more equated to a 90% specificity for acute infarction. 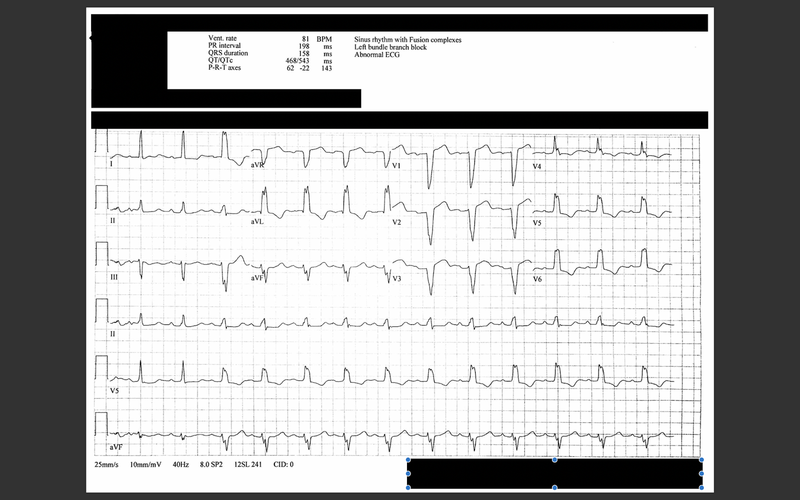 Excessively discordant ST elevation > 5 mm in leads with a -ve QRS complex (score 2). ≥ 1 lead with ≥ 1 mm ST elevation that is out of proportion to the size of the QRS, as defined by ≥ 25% of the depth of the preceding S-wave. Unlike the original point scoring criteria, if any of the modified criteria are present then the cath lab should be activated. Accurate measurements are critical in using this criteria. To be precise, the depth of the S wave should be measured in reference to the PR segment. The height of the ST segment should also be measured in reference to the PR segment and at the J point. The modified Sgarbossa criteria have undergone external validation and found to perform better than the original criteria.ref This means that it is time they were more widely used in everyday clinical practice. Back in 1996, Sgarbossa et al. also studied ST changes in ventricular-paced rhythms. They found that similar criteria was useful in this setting, i.e. concordant ST elevation, concordant ST depression in V1-3, or excessive discordant ST elevation >5mm was also reasonably specific for acute infarction in patients with a ventricular pacemaker. The sensitivity of these signs is low, meaning that you can't rule out infarction based on the absence of these signs. So far there is limited data available for using this criteria in other wide complex rhythms such as Accelerated Idioventricular Rhythm (AIVR), but there are some case studies suggesting that it might be relevant for these rhythms too. Case studies have also shown that it is possible to see evidence of coronary occlusion in Ventricular Ectopic Beats (VEBs), even if the underlying rhythm does not always show ST changes. Right Bundle Branch Block (RBBB) doesn't need the Sgarbossa criteria because it doesn't usually have any associated ST elevation. Any ST elevation is suspicious for MI in the presence of a RBBB! This ECG is from a woman in her 40s who presented with chest pain that had been waxing and waning over the past 24 hours. She had a history of renal failure on dialysis, hypertension, diabetes and a normal catheterisation a year ago. This was her initial ECG. This ECG shows sinus tachycardia with nonspecific intraventricular delay, tall QRS and widespread PR segment depression. The ST segments are all discordant apart from V4 and V1. These changes were dynamic over serial ECGs. The cath was again normal. Echo showed a trace of pericardial effusion. The diagnosis was myopericarditis. This ECG is from a middle-aged male who presented with paroxysmal nocturnal dyspnoea and hypoxia on a background of heart failure, biventricular pacemaker, ICD and previous LV thrombus. This ECG shows biventricular paced rhythm with RBBB-like morphology and discordant ST elevation in I, aVL, V3-5 due to acutely decompensated heart failure. This ECG is from a woman in her 80s presented with chest pain. She had a history of 2nd degree AV block with PPM in-situ. This was the initial ECG. This ECG is from a woman in her 70s who presented after a syncopal episode on a background of coronary artery disease. This was her baseline ECG for comparison. This ECG shows LBBB with appropriate discordant ST changes.